Are you getting optimal outcomes for your organizational resilience and business continuity plans? Do you have a way to measure this? 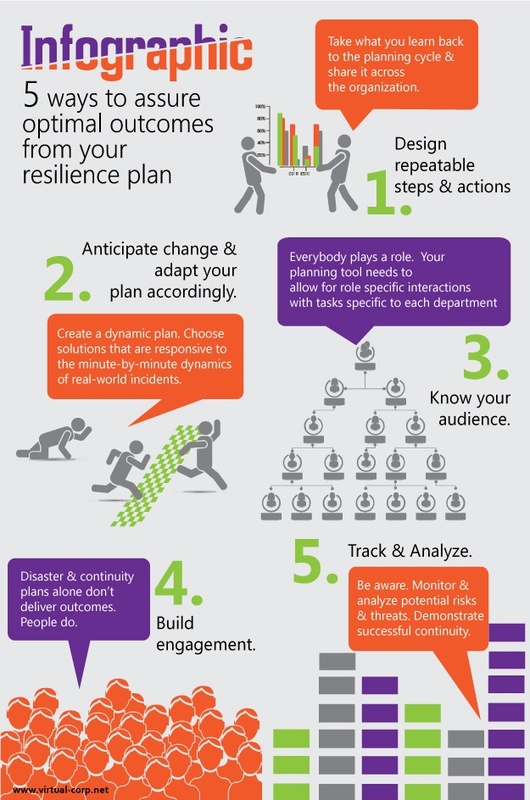 We’ll, no need to stress, we’ve got an easy to follow infographic that will show you the five (5) things you need to consider when managing disaster recovery and organizational resilience programs. Remember, it’s crucial to stay on top of your plan. Not only does it help you maintain a dynamic business continuity plan, but it also gives you the opportunity to report your success to your entire enterprise. Let everyone know how resilient the organization truly is. Not only will that inform but it will support your future programs and create a team of supporters who will be ready to show why these programs should get the attention they deserve. If you would like more information on how our team of consultants can help you with getting and staying resilient visit our website to learn more. Copyright © 2018 Cushnoc Resiliency Advisors, LLC, all rights reserved.